Are you struggling this testing season to find a resource to help prepare your kids for the high stakes testing of PARCC or other state testing? This product provides you with many resources! If you see the preview you get three weeks planned out (you can ignore the dates or follow along) of preparation strategies to implement for your students. 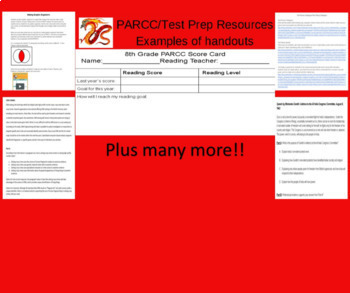 Strategies included in this activity range from PARCC like questions, strategies on how to write proper responses, how to make graphic organizers to help students see success, question examples from science, math, ELA, social studies, and more! You also get numerous hyperlinks to Kahoots, Quizziz's, videos, and more to help review with your students and motivate them to see success on PARCC. There is even walkthroughs for you as a teacher to help generate text dependent questions. This activity will help you for years to come. Use these activities as warm ups or even as small classwork preparation activities. 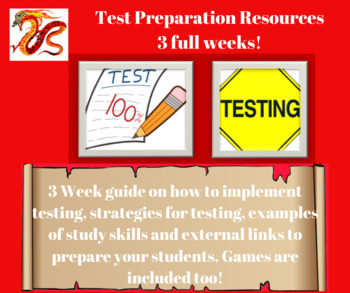 Either way you use these activities you will be preparing your students for the high stakes testing that is upcoming in your district or state. Administrators if you wish to use this in your school, please contact me about pricing. Please rate this product and give feedback for fellow users. Over 40 pages of preparation for you and your students to see success!! Visit my store for other activities that you can use throughout the remainder of the school year!